Sixteen years today since I made my first (temporary) vows in the Society. I have so many memories of the event - the people, the liturgy, the generosity of those who helped in so many ways - but pride of place must go to my remembrance of the deep, God-given joy which infused my whole being throughout the day. It's the sort of joy which can only come as pure gift; it cannot be forced or held on to, simply relished while it lasts. I made my vows as I had lived my candidacy and novitiate - with a strange mixture of certainty and incredulity. Certainty that this was where I was meant to be, that God had created me for and called me to this; incredulity and wonder at that very fact, at the mystery of God's choice, and the fact that God had called me, with all my foibles and limitations - and not someone more saintly or seemingly worthy. Somehow certainty won, but my joy was definitely deepened by the incredulity, as I could only marvel that I - me, so-not-saintly Silvana - had been blessed with this grace of vocation.
. Over the years the certainty has grown and deepened, helped in so many ways by the affirmation, love, challenge, fidelity and support of my sisters. They have helped me become the woman I am today, increasingly rooted in God and our charism. Yes, I still wonder at God's limitless patience and inexplicable taste, and probably always will, at some level; and yes, there have been times of doubt and insecurity, and probably more await... but the sources of strength and support have been greater, the graces abound and God ensures that my builders outdo my destroyers (cf Isaiah 48:17). 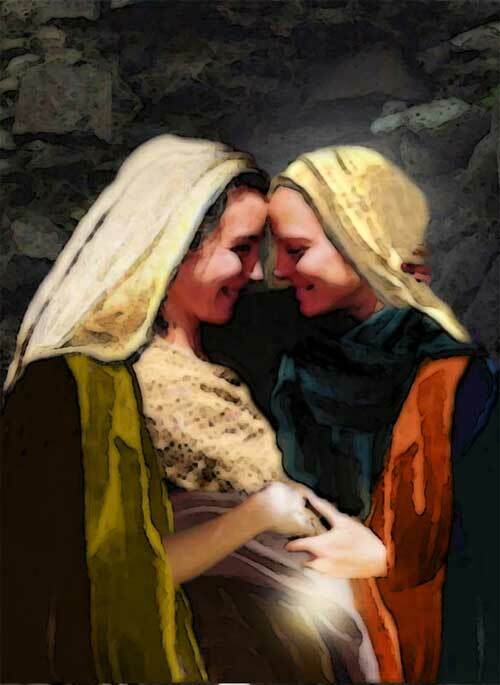 My Gospel that day was the Visitation. It's an account of love and support, of discovery and affirmation of call, all expressed through awe-inspired, confident praise and leaps of joy. And somewhere in there, I am sure, there were tender embraces, whispered confidences and quiet moments of strong, silent, affirming support. All of which, and more, is contained in this image, by Sr Claire Joy - http://clairejoy.blogspot.co.uk/ - with whose permission and blessing I am using it. The evident affection and tenderness in this image are a strong reminder that my vows are made, lived in and sustained by community, and a reminder, too, especially today, to pray with gratitude for all those through whom God's faithful, nourishing love continues to be mediated. I will renew my vows that I made to serve God in the Society of the Sacred Heart sixty years ago tomorrow. I also have a vivid memory of the day; I was only 21 and kept asking for the grace to really understand what I was doing; I have always felt that I received that grace and ended the day speaking to the children about the joy of belonging to Jesus. I had had the high school and seventh and eighth grades for sports daily for an hour and longer periods on Saturday and Sunday the whole year as a second-year novice and they had me climb on a bench in the locker room and crowded around me. I still remember the feeling I had of joy and gratitude as I spoke to them.